Lake Balaton was ironed flat on race day 5 at the 2016 GROUPAMA 420/470 Junior European Championships. Staying focused, cool and hydrated was critical, as teams relaxed around the boat park waiting for the breeze to fill in. Seven hours after their scheduled starts, the postponement flags came down and teams eventually headed out to the race track in a light, puffy breeze. One light wind race for all fleets finalized the top 10 medal race teams for the 470 Men and Women fleets and closed up the points leaderboard in the 420 Open and U17 fleets. In the 470 fleets, medals are assured to some with just the colour to be decided, whilst others will be fighting to defend their place from attack. 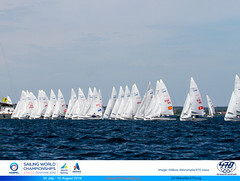 The 470 teams not in the medal race will contest a final race tomorrow. The 420 Open and U17 fleets will continue their race series, with two races scheduled on Friday 5 August to decide the Championship titles. The points difference is on a tipping point, so all is wide open. 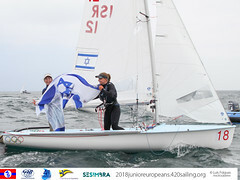 Continuing to headline the 420 Open fleet are Israel’s Ido Bilik/Ofek Shalgi, but their points advantage has been eaten into by Telis Athanasopoulos Yogo/Dimitris Tassios (GRE). Realistically the fight is between the pair of them, in a battle to the end. Two races are scheduled on Friday’s final day, but with a light wind forecast there is no certainty of both races being completed. The Greek partnership has already proven their ability to get results under pressure, winning the 420 U17 World Championship title last month, and have positioned themselves in a strong position to step to the front again. “We will remain calm and do what we know and have trained for,” commented Tassios on the challenge ahead. Sitting 26 points behind the two leaders are Vasilios Gourgiotis/Orestis Batsis who will be fighting tomorrow to hold onto a bronze medal finish. The challenge to claim the Ladies Junior European Championship title is a two-boat race between Julia Szmit/Hanna Dzik, reigning Youth Sailing World Champions, and Veronica Ferraro/Giulia Ierardi (ITA), with just 2 points separating the teams. Race 10 today yet again saw them locked in battle around the race track, with the Italians finishing one place behind the Polish. Tomasso Cilli/Bruno Mantero (ITA) retain their lead in the U17 fleet, by just a 2 point advantage over Daniel Gottlich/Linus Klasen (GER). The gap to third is significant, 32 points to Spain’s Lucas Pares/Teo Pares, so bar a disaster the leading two boats will be in an intense duel to the end. “I am so proud and so happy with our results,” grinned a delighted, but tired, Cilli at the end of today. “Tomorrow we will control the German team and we will do our best,” chipped in Mantero. The leaderboard in the 470 Men has every chance of being turned on its head in Saturday’s medal deciding race. Giacomo Ferrari/Giulio Calabro (ITA) hold a 2 point advantage over Malte Winkel/Matti Cipra (GER), but neither are assured of a medal. These two have engaged in a backwards and forwards battle at the front, swinging between tiebreaks and small point advantages. Now it comes down to one final double points medal race. Winkel/Cipra will be racing with caution after their recent experience at the 470 Junior Worlds, which saw them as hot favourites for the title, but ultimately finish 7th. Winkel reflected on the past days, “It is hard and really challenging, and we are also good friends as we train together. But ashore we are friends and can laugh about our situation out on the race track. “I am quite happy that we can grow up in the 470 together and we can push each other to the limit and it is now finally so close. We are both improving from each other. “Tomorrow will be a big fight, we will see a lot of attacking and defending, a lot of tactics in the races,” he concluded. Theoretically, any of the top five teams have a shot at the medals. Of the top ten boats in the Medal Race, there will be a three-way battle for the medals. Championship leaders Benedetta Di Salle/Alessandra Dubbini (ITA) seem unbeatable, having led the 33-strong 470 Women fleet since race 1. The Italians are guaranteed one of gold or silver, with only the Germany’s Frederike Loewe/Anna Markfort capable of stealing gold. 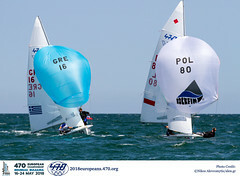 Loewe/Markfort will need a radical race outcome to seize Junior European Championship gold, with a win to them and the Italians placed 9th or worse. But never underestimate this pair, who last appeared on the Junior European Championship podium in 2014 to claim bronze medals. The Germans will be hunted by Spain’s Silvia Mas/Paula Barcelo of Spain, who will be aiming to convert their third place going into the medal race to a second by the end. Mas/Barcelo picked up silver at last year’s Junior Europeans, and won the 470 Women Junior World Championship title in June this year. Two races scheduled for the 420 fleets on Friday 5 August, with an 09.55 first warning signal. 420 Open Gold fleet will start first, then 420 Open Silver, followed by U17. The 470 Men medal race is scheduled to start at 1030 hours, followed by the 470 Women at 1115 hours. The final race for the rest of the fleets is scheduled to start at 1300 hours with 470 Women, 470 Men Gold, then Men Silver. The 2016 GROUPAMA 420 and 470 Junior European Championships, 29 July-5 August 20106 is organized by Balatonfüredi Yacht Club in co-operation with the Hungarian 420 & 470 National Class Association, the International 420 Class Association, the International 470 Class Association and under the auspices of the Hungarian Yachting Association. 406 sailors from 23 nations are competing, with 83 boats in the 420 Open fleet, 38 teams in the U17 420 fleet, 33 teams in the 470 Women and 49 teams in the 470 Men. Competing nations are: Argentina, Australia, Austria, Belarus, Croatia, Cyprus, France, Germany, Great Britain, Greece, Hong Kong, Hungary, Israel, Italy, Japan, Lithuania, Poland, Slovenia, Spain, Switzerland, Turkey, Ukraine, USA.